Good news for royalty owners in the Delaware Basin in West Texas. The Delaware Basin is a geologic formation that is well known for holding large oil fields. 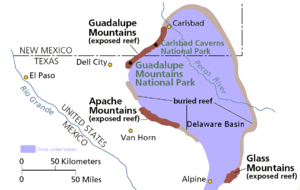 Guadalupe Mountains National Park in Texas and Carlsbad Caverns National Park in New Mexico are located within the Delaware Basin. The Delaware Basin is actually part of the much larger Permian Basin of West Texas. Anadarko Petroleum Corporation had previously announced that they would probably cut the number of working oil rigs in this area from 6 to 4 rigs. However, in July, Anadarko announced that because they have made their operations more efficient and lowered drilling costs, they’re going to keep all six drilling rigs working. A spokesman for Anadarko indicated that they expected the price of oil to increase to about $60 per barrel in 2017. Many people in Texas and elsewhere depend on royalties from Texas oil and gas wells. In addition, working oil and gas rigs keep many people employed working the rig, as well as generating income for many satellite vendors and services. They are a very important part of the Texas economy.